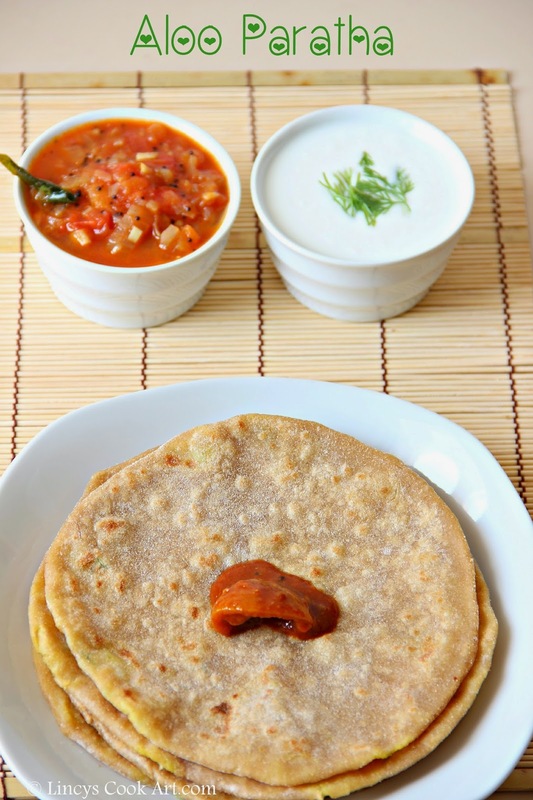 Aloo Paratha is a very popular paratha from North India. This parathas are easy to make stuffed parathas. At my home generally prepared during travels with tomato thokku. Perfect for kids lunch box recipe. Aloo parathas with the addition of onions gives more taste. I sometimes makes with the addition of onions too. Suppose if you are planning to add onions fine them very finely. Very yummy paratha liked by all age groups. Simple yet healthy and tasty parathas. Pressure cook the potatoes till soft on medium flame till 3-4 whistles. Open the cooker after the steam releases and allow the potatoes to cool. In a bowl add the wheat flour, oil, salt and mix well. Then add enough water to make it as a dough. Transfer the dough into the flat surface and knead to make it as a smooth dough about 3 minutes. Keep it aside till you make the stuffing. Peel and mash the potatoes and add turmeric powder, chilli powder, garam masala, cumin powder/seeds, coriander leaves and salt; mix well. Make this stuffing into smaller balls than the paratha dough balls to accommodate the stuffing properly. Spread the paratha dough slightly to stuff the balls. Keep the potato balls inside the spread-ed dough. Gather the edges of the parathas together, press and seal the edges. Dust the surface with atta and roll the parathas into thin parathas without stuffing poping out from the parathas. Heat the pan and add 3-4 drops of oil; place the parathas and allow to cook on both the sides by flipping and cook the both sides till the air pockets colour turns in to dark golden to light brown colour. Remove the paratha from pan and serve hot. Note: You can add very finely chopped onions also in this parathas. Some times i prepare that way too. Serve hot with Subzi/Curry/ Raita or Pickle. Very perfectly made aloo paratha. wWll surely try this. That looks divine! Such an easy recipe too. Aloo parathas are perfectly done..nice clicks . Aloo parathas are always my favourite, never get bored of them. I don't mind parathas once a while. To be honest, I'm drooling over the tomato chutney. That is so good. Mouthwatering Aloo parathas... Feeling hungry now..
Love aloo paratha any time... Looks delicious..